The American Bar Association recently published the results of its 2017 Legal Technology Survey. One of the key findings that really stand out, is that in 2017 more than half of the lawyers are using cloud computing. Where in 2015 only 30%, and in 2016 38% of lawyers were active in the cloud, that number has jumped to 52% in 2017. The enthusiasm for cloud-based solutions is not shared equally by all lawyers. 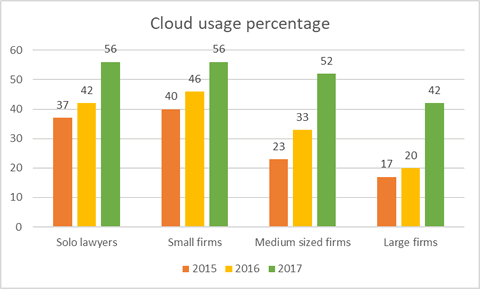 As was the case in previous years, cloud services are most embraced by solo and small law firm (2 to 9 lawyers), with 56% in both groups relying on cloud computing. For medium sized law firms, the number stands at 52% who are using web-based computing. Large law firms trail behind, with only 42%. As the graph below shows, for each group, there has been a steady growth in cloud adoption over the last few years. Overall, 31% of lawyers make online backups of their data. Again, the solo lawyers lead the way with 48% of solo lawyers making cloud back-ups. The predictions for 2018 are that the popularity of cloud-based solutions will continue to grow. In a recent panel discussion, the panel members were asked to make legal technology and management predictions for 2018. Four out of nine members mentioned an accelerated adoption of legal cloud services. Overall, resistance to adoption is decreasing among lawyers as most providers of cloud-based services for lawyers have been on the market for a long time, and have plenty of experience. Because most lawyers are using Office 365, they have also become more familiar with using cloud services. One panel member observed that cloud services have become more all-encompassing and a lot less trouble and expensive than on-premise solutions. Easy browser access (73%). Everybody can use a browser and there’s at least one installed on every device with online access. 24/7 availability (64%). You can have access at any time, from anywhere. Low and predictable cost (48%). The entry fees for cloud-based legal solutions are fairly low, and they are typically billed either monthly or annually, making the cost predictable. Add to that, that you need to invest far less in hardware infrastructure. Robust data backup and recovery (45%). If you use cloud-based solutions, the service provider typically takes care of data backups, and they have the in-house expertise to quickly get everything back up and running if needed. They typically also have disaster recovery plans (and the necessary infrastructure) that can be implemented instantly, or on very short notice. Ability to quickly get it up and running (38%). Typically, all you need is a device with access to the Internet, and your subscription to the cloud service to get started. No need to buy, install or configure new hardware or software on premises. Elimination of IT & software management requirements (30%). This is an important consideration for mainly solo lawyers and small law firms, as they don’t have to invest in managing an entire IT and software infrastructure. The cloud service provider makes sure the software works and is up to date. Better security than can be provided in-house (25%). When you host your own servers, and provide Internet access to them, security is a constant concern. It’s not obvious to always have the latest patches, a perfectly configured firewall, etc. Because it’s part of their core business, external cloud service providers are experts in secure provision. More likely than not, your data will be safer in the cloud. It is also worth noting that when using cloud-based services, you’re staying ahead of the curve, without having to worry whether the technology will cause any problems. This can be used as a business advantage. Cloud services also can give your law firm extra flexibility, which, again, can be used as a business advantage.